Our Raincap Covers are inexpensive, waterproof tarps used for keeping the elements, such as rain and snow, out of waste containers. Raincap Covers are also great for keeping odors and contaminants from escaping into the environment. Our Raincap Covers provide a durable, yet cost effective alternative to covering stationary containers with expensive transport tarps. Our Raincap Covers have a convenient fitted-front design, along with vinyl reinforcement in each corner. A convenient drawstring is used to provide a secure and tight fit. Bungees can also be used with the drawstring to provide additional support. 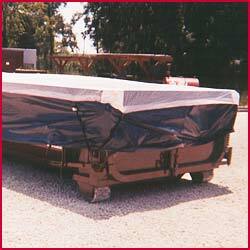 By utilizing Our Raincap Covers on rented containers, waste haulers can save expensive tarps for transporting. The result is reduced inventory costs!